a. This publication sets forth planning policies and procedures to govern the joint activities and performance of the Armed Forces of the United States. It provides military guidance for the exercise of authority by combatant commanders and other joint force commanders and prescribes doctrine and selected joint tactics, techniques, and procedures for joint operations and training. It provides military guidance for use by the Armed Forces in preparing their appropriate plans. operation plans and operation orders prepared in response to National Command Authorities (NCA) or the Chairman of the Joint Chiefs of Staff (CJCS) requirements. It specifies the policies, procedures, and formats to be used across the spectrum of planning, mobilization, deployment, employment, mobilization, sustainment, redeployment, and demobilization as applied to the members of the Joint Planning and Execution Community (JPEC). JOPES is applicable across the operational continuum of peace and war. 1. Purpose. This chapter describes the interrelationships of the associated national-level systems for national security policy, military strategy, force and sustainment requirements, and plans and their impact on the joint planning process. 2. The National Security Council (NSC) System. The NSC is the principal forum for deliberation of national security policy issues requiring Presidential decision. The NSC system provides the framework for establishing national strategy and policy objectives. The NSC develops policy options, considers implications, coordinates operational problems that require interdepartmental consideration, develops recommendations for the President, and monitors policy implementation. The Chairman discharges a substantial part of the statutory responsibilities as the principal military adviser to the President, the NSC, and the Secretary of Defense through the institutional channels of the NSC. The Chairman regularly attends NSC meetings and presents the views of the Joint Chiefs of Staff and the combatant commanders. The NSC prepares National Security Directives (NSDs) that, with Presidential approval, implement national security policy. These policy decisions provide the basis for both military planning and programming. (1) Providing advice and assistance to the President and Secretary of Defense on the strategic direction of the Armed Forces and the preparation of policy guidance. (2) Preparing military strategy, strategic plans, and strategic assessments. (3) Providing advice to the Secretary of Defense on the effect that critical force capability deficiencies and strengths will have on accomplishing national security objectives, implementing policy, and executing strategic plans. (4) Providing advice on program recommendations and budget proposals to conform with priorities established for the CINCs and in strategic plans. b. 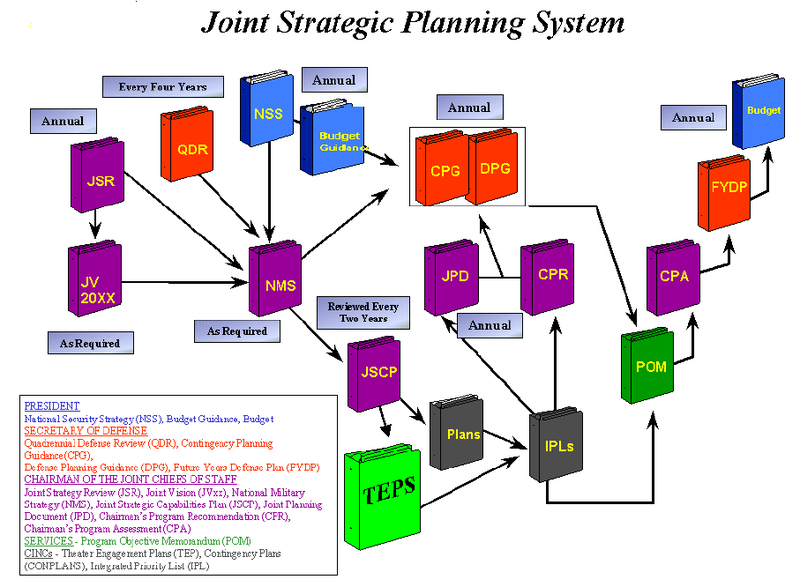 The JSPS is a flexible system that forms the basis for interaction with other DOD systems; provides supporting military advice to the DOD Planning, Programming, and Budgeting Systems (PPBS); and provides strategic guidance for use in JOPES. Figure B-1 shows the relationships between various programs and planning documents. c. The JSPS provides the means for the Chairman, in consultation with the other members of the Joint Chiefs of Staff and the CINCs, to systematically review the national security environment and US national security objectives; evaluate risks and threats; assess current strategy and existing or proposed programs and budgets; and propose military strategy, forces, and programs necessary to achieve national security objectives in a resource-limited environment. d. JSPS provides for the continuous study of the strategic environment to identify conditions or trends that may warrant a change in the strategic direction of the Armed Forces. The principal mechanism for this study is the Joint Strategy Review (JSR). A decision to modify the strategic direction of the Armed Forces based on this review would be reflected in the National Military Strategy (NMS) or the Joint Vision. (1) The NMS articulates how the United States will employ the military element of power to support the national security objectives found in the President’s National Security Strategy (NSS). (2) The Chairman’s vision, referred to as Joint Vision 2010, describes the operational concepts and capabilities required of future joint forces. It provides a conceptual template for the conduct of future military operations and establishes a common azimuth for the Services, combatant commands, Defense agencies, and Joint Staff as they develop plans and programs to evolve the joint force to meet future operations requirements. e. The JSPS products, particularly the NMS, assist the Chairman in providing for the preparation of contingency plans and development of the Joint Strategic Capabilities Plan (JSCP). The JSCP provides strategic guidance, establishes requirements, and apportions resources to the CINCs and Service Chiefs to accomplish tasks and missions based on near-term military capabilities. 1. Purpose. 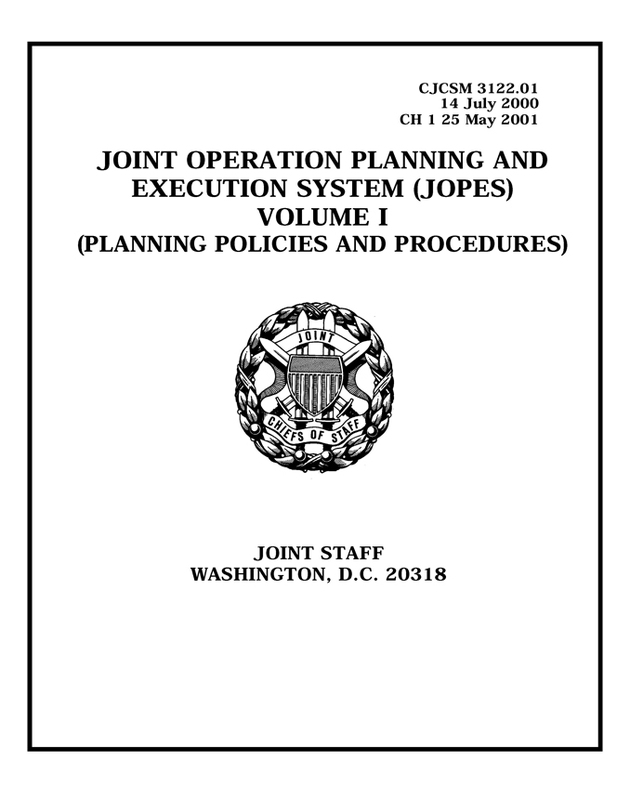 This enclosure describes the applicability of JOPES to deliberate planning, describes the deliberate planning process for operation plans, outlines responsibilities and recommended time requirements for the planning cycle, and provides guidance for resolving conflicts. 2. Applicability. 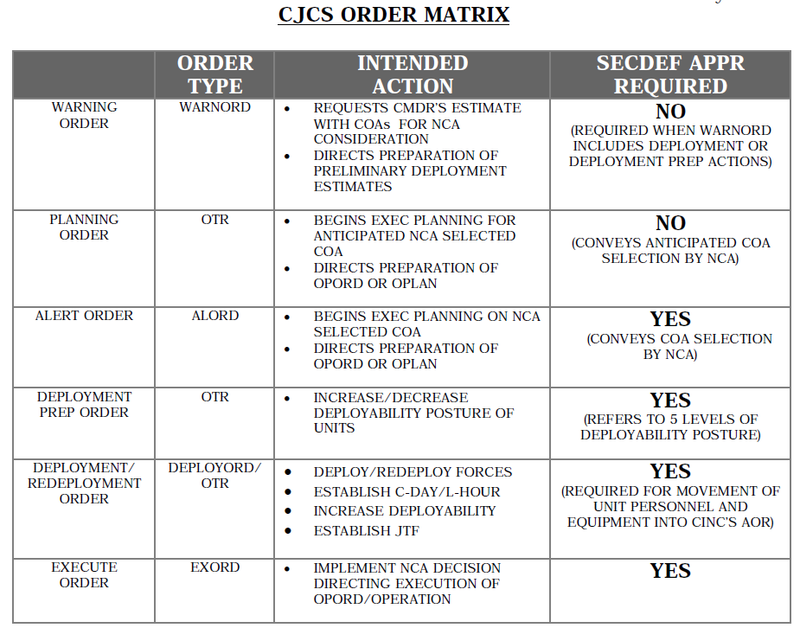 With the exception of the Single Integrated Operational Plan (SIOP), JOPES applies to operation plans prepared by CINCs in response to CJCS requirements. Operation plans are prepared in complete format (OPLANs) or in concept format (CONPLANs) as described below. 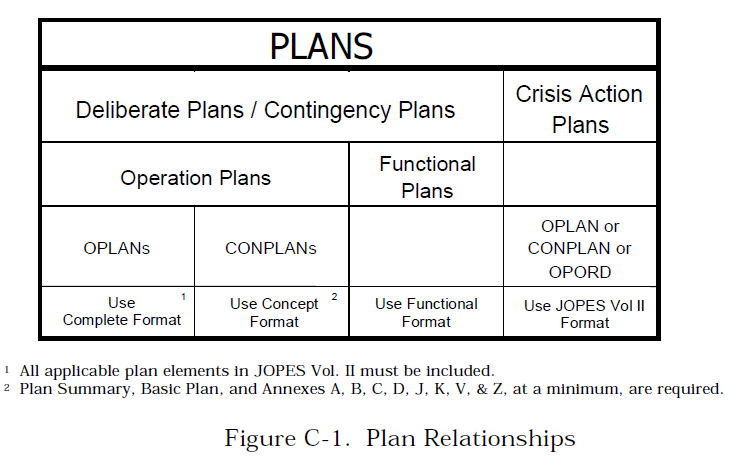 Figure C-1 shows the relationship of the various terms used in JOPES and the planning process in general.